Lt. Col. Gregory C. Scrivens, USAG Bavaria Chief of Staff, makes remarks at the 2018 Graduation Ceremony and highlights better-future opportunities with an university degree. 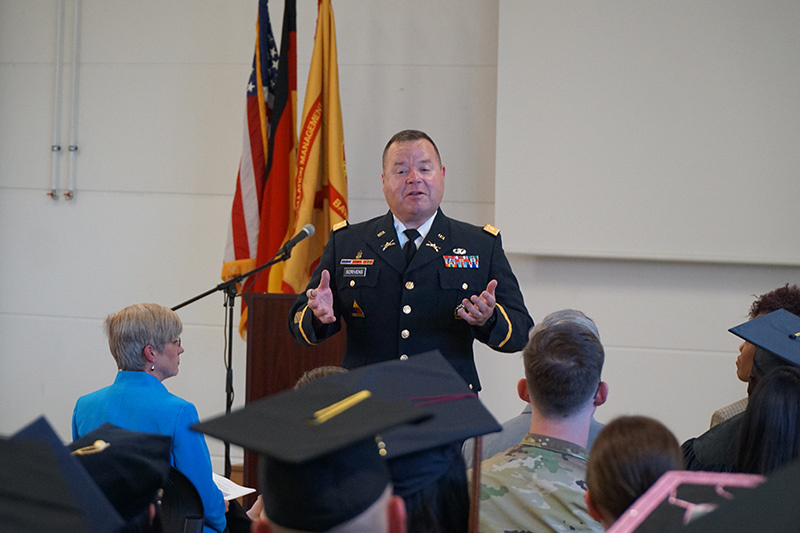 GRAFENWOEHR, Germany — Soldiers as well as community member graduates received their associate, bachelor’s and master’s degrees during a ceremony May 18 at Rose Barracks. Since last year, 2,100 Soldiers in the U.S. Army Garrison Bavaria footprint have completed more than 6,000 college courses using more than $4 million in Army tuition assistance. Additionally, about 400 community members completed their college or university degree or credential during the last year. Forty of the 400 were recognized from 20 different academic institutions during the ceremony. Most of the students had challenges they faced like transitions, deployments and the other struggles that come with military family life. It can make it twice as hard to focus and finish a degree. “For some of you, it may have taken you longer than you expected to earn the piece of paper you’re about to receive. But you’ve earned it. You’ve crossed the finish line,” said Lt. Col. Scrivens, USAG Bavaria chief of staff. Education is an integral part of the Army culture with lifelong learning for everyone. Education enhances quality of life and mission readiness. This educational milestone opens doors for future job opportunities. “By equipping yourself with an academic degree, you’ve unleashed the power to expand your horizons, to open new doors and to excel in whatever you are passionate about,” said Scrivens.